When a major Local Authority wanted to improve the energy efficiency of their civic offices they chose Ferroli to help them complete this logistically complex project, which involved the installation of three 1.4MW Prextherm AS boilers. Ferroli’s Commercial & Industrial boilers division has for a long time worked with major Local Authorities across the UK on projects ranging in size and complexity. Having completed previous works successfully within some of this particular Local Authority’s outlying commercial properties, Ferroli was naturally considered for the most prestigious of the Authority’s projects – their own offices. Ferroli worked with the in-house mechanical team and then alongside the appointed contractor to successfully deliver the three Prextherm boilers within the given timeframe. Due to their size and the difficult location, the boilers were delivered one by one on specialist transport. The Authority closed roads to enable the access and timescales had to be strictly adhered to minimise the disruption to the local community. Ferroli is proud to be a part of this kind of project and this particular installation highlights our ability to provide the best possible service to the client through working closely together and being there every step of the way. 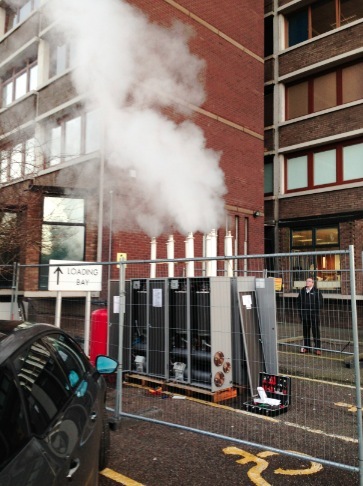 Ferroli received an urgent phone call one Monday morning from customer WTG Heating, which specialises in providing temporary boiler installations, with a request for central heating boilers that could provide 1MW of heat to a 16 storey building in Sidcup, Kent. The building’s existing boilers, which were supplied three years ago by a different manufacturer, were not performing well enough and the customer was looking for a quick, low cost alternative before the cold weather set in. Ferroli’s solution was quickly and easily put into action using four Energy Top B250 floor standing condensing boilers in conjunction with a matched plate heat exchanger. The Energy Top boilers in modular format are easy to install due to their cabinet design already incorporating the gas and hydraulic flow and return manifolds and boiler duty pumps. The inbuilt sequence controller meant the boilers could be linked together without the need for expensive external sequence controls. Ferroli was able to offer all of this from its well-stocked warehouse facility in the Midlands. The boilers were collected by WTG Heating on the Wednesday of the same week and were installed and fully functioning by the Thursday morning. 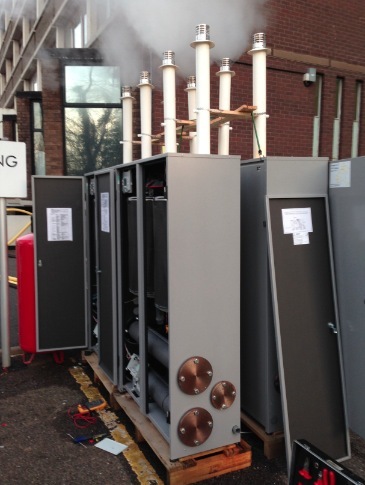 This temporary installation of 909kW was set up outside in the car park of the building where, despite the incessant rain, the condensing Energy Top boilers have continued to perform perfectly thanks to their aluminium construction. The compact boilers have impressed with their small footprint and superb performance and may now be installed permanently in a smaller plantroom than was previously required for the old boilers. Ferroli’s ability to offer expert advice, despatch flexibility and bespoke after-sales support meant the building was quickly up to temperature with little or no disruption to the end user. 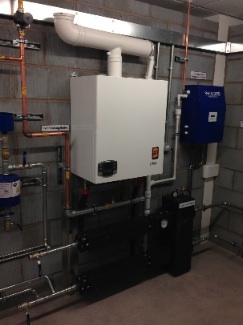 The customer was amazed that the compact new Ferroli boilers were able to do the same job as the massive boilers they had replaced and heat such a large building so efficiently. Ferroli has successfully supplied an Econcept 51A boiler, flue header and ancillary parts to be used to train and educate engineers of the future at the Greater Manchester Sustainable Engineering University Technical College. Ferroli came to the rescue of SBS (Smith Brothers Stores Ltd), one of our merchant partners, which was tasked with supplying equipment for the college’s brand new engineering and construction facility. SBS had been let down by another supplier and with the deadline for completion fast approaching, they turned to Ferroli for help. The tight schedule didn’t put us off and within days of agreeing to supply the project with the required products the equipment was on-site and ready to be installed, all delivered from stock held at Ferroli’s distribution centre and head office in the Midlands. The facility is situated on the 7th floor of the ICC (Integrated Care Centre) building in Oldham next door to the new UTC building which is currently under construction and due to open to students aged 14 – 19 in September 2014. Once the new building is complete, the Ferroli Econcept 51a boiler package will be replicated as an installed and fully working model for the students to train on and play with. Not only can they touch and feel the boiler in the ICC awareness facility but they’ll have the continuity of also getting to train and tinker with a working boiler of the same model in the UTC. Ferroli is proud to play a part in any initiative that lights a spark in the minds of future engineers and helps to train and educate the next generation. 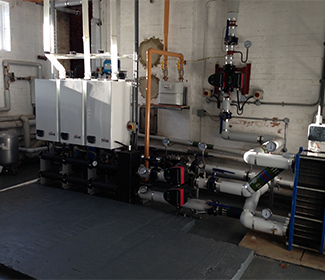 Ferroli’s Energy Top cascade mounted condensing boilers have replaced an old inefficient installation at a school in Luton. Working closely with the consultant and contractor, the boilers were selected for their energy efficiency against what was a dated and ever-increasing costly system to run. 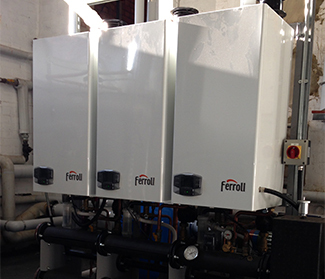 Ferroli supplied the three W125 boilers, frame kits, hydraulic manifolds, hydraulic separator and flue into the plant room which once housed old cast iron sectional boilers. 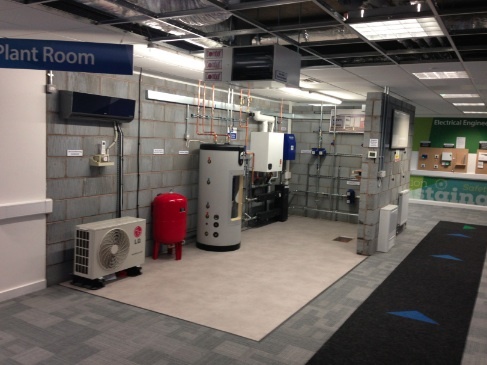 As well as the considerable energy savings that the Energy Top boilers deliver, they have also freed up a massive amount of space because of their small footprint, which will allow the school to divide the room to create another storage area. 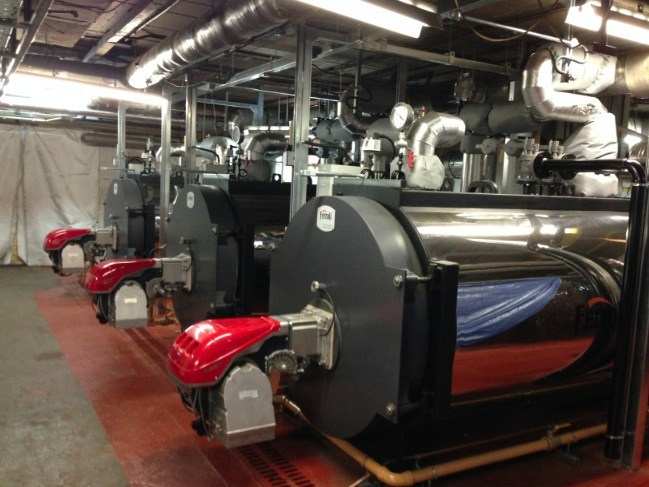 Ferroli advised the school’s contractor on both the benefits and the pitfalls of upgrading an old system with new condensing boilers. The pipework and old radiators currently remain so it was extremely important to consider the use of a plate heat exchanger.